Bicycle Manufacturers – Please contact CEW Sales directly at 1-800-479-4335 to fulfill your production requirements. Our sales and design staff will personally assist you in getting the precise wheel to meet your needs. Orders may be placed by phone, fax, or mail 7:00 am – 4:00 pm CST Monday through Friday. To expedite orders please specify the part number of the item ordered. Most of the previous Skyway PN’s beginning with “WHL” have been replaced with CEW PN’s. These have all been cross referenced in our system so if you just know the old Skyway PN we can work with that too. To avoid duplication please mark all confirming orders. Minimum order quantities are typically 120 units for wheels over 12″ and 1,000 units for smaller wheels. Our sales department will be available to assist should smaller quantities be needed. 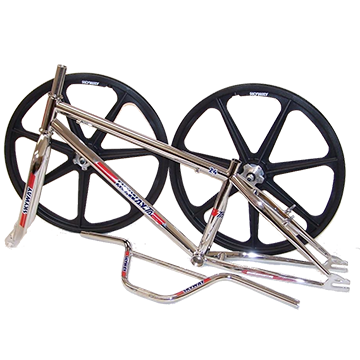 Individual Buyers – The best way to get genuine Skyway by CEW Tuffwheels® is through your favorite local independent bike shop or mail-order warehouse. If your bike dealer is not sure which distributor to contact, please ask them to call CEW at 1-800-479-4335 for assistance. Most bike shops carry what their customers ask for, so if you want the shop to carry “Tuffs” you must ask. Get your friends to ask too! Be sure to specify Skyway Tuff pads to go with your wheels. They are formulated to provide optimal braking on our composite rims. Finally, if you cannot seem to find what you need you may contact Skyway for additional assistance.